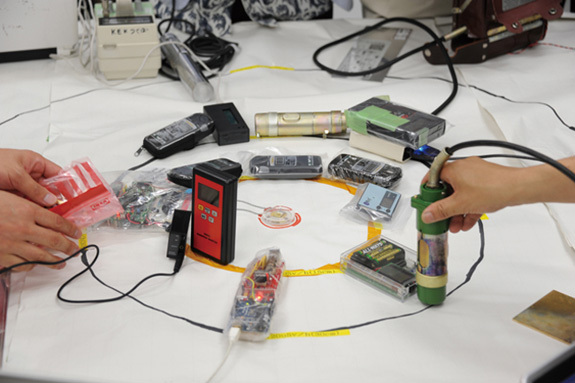 Geiger Counter Meeting:PROJECT 2 SUPPORT:WA WA PROJECT-Social Creative Platform for Opportunity-Know and support projects in eastern Japan ! Media artist. Born in 1966. Major works include "Inter Dis-Communication Machine", "PostPet", and "OpenSky". He has also developed work commissioned by 3331 Arts Chiyoda. As widely known, due to the nuclear power plant incident, radioactive materials have spread to different regions of Japan. However, the amount of radioactive material in each district varies widely, and so the only way to find out the true amount of radiation hidden to the eye is to record it with measuring equipment. In using a "geiger counter" for the first time, how do we measure radiation levels, and how should we consider the readings? With the cooperation of a physicist and an SF writer, these questions are answered in an open study session.